Western Libraries Heritage Resources is partnering with Congregation Beth Israel for a Used Book Sale! 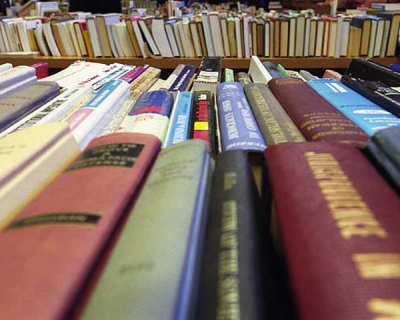 The sale will be at the Congregation Beth Israel (751 San Juan Boulevard, Bellingham) on Sunday, April 28, 2019 (“Mitzvah Day”), from 10:30 a.m. to 4 p.m.
A large selection of Judaic books and media will be available, including fiction and non-fiction, children’s titles, Jewish life and religion, Torah commentary, reference and art books, Jewish history and the Holocaust, records and CDs, and more. The sale is to be held in the downstairs nursery school. Arrive early for the best selection! Most books will be priced at $1.00 and cash or check only will be accepted as payment. Proceeds will benefit the Beth Israel Library and the Western Libraries Heritage Resources Judaica Collection. If you have any questions, or if you would like to volunteer, please contact Joan Wayne at jawayne2@gmail.com, or David Schlitt at schlitd@wwu.edu.